The Fifties were indeed fabulous; Longer! Lower! Wider! Faster! and, as it turns out, a lot heavier to boot. The new Interstate Highway system beckoned and in the mid 50's it seemed anything was possible. Ford was expanding. Following in GM's foot steps Ford would have a product ladder that would include five brands, Ford, Edsel, Mercury, Lincoln and Continental. To support all those choices Ford would introduce two new engine lines for 1958. The FE for Ford and low end Edsel models, and the MEL for the bigger Mercury, Edsel, Lincoln, and Continental offerings. And then it all started to crumble around them. A very drastic recession hit in 1958 and new cars sales were hit harder than anyone had ever seen before. Just when Ford set the standard for big engines the bottom of the market dropped out. You couldn't order a Cougar in 1958 but you could get 400 horsepower under the hood of this big Merc! The MEL series would consist of three displacements; 383, 410, and 430 cubic inches. The 383 called the Marauder, was used only in Mercury vehicles. The 410 was used exclusively in the high line Edsel Citation and Corsair models. No other Ford product would use this engine. the 430 would do all the heavy lifting. It was called the Bulldozer for its more than ample torque. It powered all '58 to '60 Lincolns and Continentals. A slightly detuned version was available optionally in Mercury models and in the Thunderbird up to 1960. The Super Marauder, equipped with three two barrel carbs was the first American production car engine to put out 400 horsepower. Almost as quickly as the new engines were released the focus shifted towards smaller more economical power plants. The tiny 144 and 170 cubic inch Thriftpower inline sixes were introduced in the fall of 1959 and the light weight Windsor 221 cubic inch V8 would appear in 1961 in the all new for '62 Fairlane. However, the move towards small engines stalled almost before they could hit the show room floor. When Robert McNamara departed Ford Motor Company to become President Kennedy's Secretary of Defense late in 1960, it opened the door for young Lee Iacocca to take the reins. He had one of Ford's better ideas; Total Performance. Ford would win on Sunday, to sell on Monday, and you needed some serious power under the hood to make that happen. But by the time that happened Edsel was gone. Lincoln was reduced to single model, and Mercury's were all based very closely on similar Ford models. Ford now had too many big engines and too few cars. The 430 MEL engine would live on in the Lincoln and by 1966 would grow to 462 cubic inches, becoming the largest displacement engine ever installed in a Ford car. The lighter weight more compact FE would get punched out to 390 cubic inches easily replacing the smaller MEL versions. In 1961 the 390 was available with an optional three two barrel set up that would make 401 horsepower. Not content with the 400 horse 390, Ford decided to go even bigger with a 4.13' bore and the 390's 3.785" stroke to create the new 406. The 406 also got fitted with cross bolted mains, Power was up slightly to 405 horsepower. But there was still more on the table; NASCAR would allow up to 7 liters (427 cubic inches). What came next would become legend: the 427. Once again bore was increased to 4.2328", stroke stayed the same as the 390 at 3.784" (actual displacement was 425.98 cubic inches). This was the absolute limit for bore size. Any shift in the core during the casting process would result in an unusable block. Special heat treatment tunnels were created to let the blocks cool more slowly to avoid any deformation during cooling. The end result was powerful, relatively light, and incredibly expensive to make. The 427 would become essentially a "race only" engine option and production would be extremely limited. With two four-barrel carbs the 427 was rated at 425 horsepower but actual output was closer to 500 HP. In 1966 The final step in the evolution of the FE was the 428. By using a more comfortable 4.135" bore and increasing the stroke to 3.985" it was possible to create an almost identical displacement engine with tremendous low end torque to pull the big sedans and wagons. With the 427 in the stable, Ford engineers were not really looking for ways to hop up the 428. Fortunately one of their dealers was. Tasca Ford dipped into the Ford parts book and created what we know today as the Cobra Jet 428. By 1966 it was clear that Ford would need a new engine architecture to go anywhere larger than 428 cubic inches. The limiting factor of the FE was the bore spacing or the distance between cylinder center lines. The maximum bore size of the FE was limited by its 4.63" bore spacing. Additionally the crankcase also limited the maximum stroke. Chrysler used 4.80 spacing on its big 440, Chevrolet had 4.84" on their 427, and Cadillac had whopping 5.0" for the upcoming 472. Ford would pick 4.90". It was the same dimension that the old MEL 430 had run. The crank case would also increase in size to allow for longer throws. The new engine would get its name from the 3.85" crankshaft throw in its 460 cubic inch incarnation, and be known as the 385. In keeping with the theme, the new engine was longer, wider, and heavier. Enough so that it would influence the design of several car lines from the intermediate Mercury Montego and Ford Torino, and even the Cougar and Mustang. For 1968 the 460 would be installed in the Lincoln, and Ford would install the smaller 429, that would become know as the ThunderJet, in the Thunderbird . In 1969 the new 429 would replace the FE in full size Fords and Mercurys. In 1970 the roll out would include the intermediates and the 385 would get treated to the same hot-rodding recipe that created the Cobra Jet 428, the resulting Cobra Jet 429 was rated at 375 HP, 40 HP more than the 428. 1971 would see the new 385 installed in the new Cougar and Mustang and with few exceptions, replacing the FE. So what would have happened if Mercury had tried just a little bit harder to make the new 385 fit in the Cougar. It would have given Cougar owners a little more bragging rights: sure the Mustang has a 428 but the Cougar goes up to 429!. That's one higher.. Could the mighty 429 have fit the new for '69 / '70 Cougar chassis? Our August 2018 Ride of the month answers the question. So after all the big cougar shows I was at last year and involvement with the Cougar community, I decided I wanted another Cougar, and set my sights on a 69/70 XR7 hardtop fully loaded and preferably a big block. Options and colors were more important than a BB. AND I was not looking for another project. I was not up to another ground up restoration. Financially it made more sense to buy a nice previously restored car. Or more preferably a clean low miles original, but those are harder to find these days. 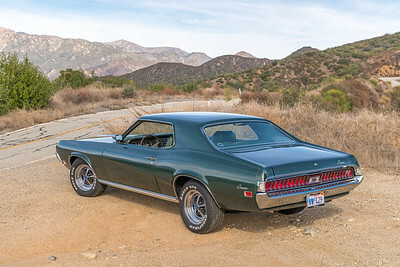 Several months later (late last year) I got a call from another So Cal Club member telling me that he is aware of an older, non-active club member that has two 1970 Cougars that he had decided to sell as he was not driving any more. Nobody had seen these cars in years. Neither car was what I really interested in, but the pictures showed what were two really nice clean cars. One was a convertible the other a resto-mod (technically), but they looked nice. So I talked to a few of the older club members to see if any of them knew the owner or anything about the cars history and restoration to gather some preliminary info. Like what I heard about the build, I then arranged to meet the owner and see the cars. They were only 30 miles from me here in So Cal. When I arrived, the convertible had an interested party, but the other was washed and in the sun in front of his garage, and I immediately liked what I saw. A beautiful dark green Cougar with cool looking Magnum 500’s. Upon further inspection I found a very well done restoration of a base model small block, fairly well optioned. What was more interesting was that the previous owner replaced the 351/FMX Automatic with a 429 and a top loader. It was the car he always wanted to build. Around 2003 or so the previous owner found a nice straight clean candidate for this build. A car that was originally sold and spent its whole life in the San Gabriel Valley. It was medium lime green with a green interior with all original sheet metal and absolutely no rust. He hired a local Mustang restoration specialist to do the restoration and drivetrain swap. He sourced a 1971 429 Block and heads and a 1967 wide ratio top loader and competed the restoration of the car with the intent of making the whole thing look stock, as Ford would have built the car. All Ford or FoMoCo parts were used. And overall they did a very nice job. He built it, drove it to a few local shows, then parked it never to be driven for years. He had clocked less than 1000 miles since he built it. No AC but there it is, a 429! After purchasing the car, I decided to drive it home; hey it was only 25 miles. It stated off driving well, but then overheated. I guess sitting un-used for so many years took its toll on the cooling system. So first I went through the entire cooling system including a proper re-core of the radiator, installing a high flow water pump, and updating the thermostat. The Cougar was originally an AC car, but for some reason they never put back the under hood AC components. I’m guessing they didn’t because it wasn’t easy. But AC is a requirement for me. After some research I decided to go with some after market parts in an underhood kit from Classic Auto Air. I spoke to them about things unique to the car, and they sent me the parts. All fit well and now I had AC. Then, on the first hot day in traffic, I again had over heating problems but only in stop and go, all was fine at highway speed. That fact, plus the previous work on the cooling system meant only one thing, the fan was not moving enough air. In the build, they reused the 5 blade non clutch fan that came from the 351. It just was not moving enough air. So my plan was to buy a HD 7 blade fan and clutch, but they would not fit. With the 429 based drivetrain, there wasn't enough space between the water pump shaft and radiator. So I tried several combinations of fans and spacers until I found a combination that would properly fit and not hit anything. This was not easy, as another issue was the after market AC compressor and bracket also sit farther forward than the stock set up. I finally found a 6-blade HD fan and spacer that fit. Now with this and the other new cooling components, all is working great. New AC and new cooling system installed. Next, as I started driving the car, I realized that the gearing was not really highway friendly. So I needed to either change the rear axle ratio (3.50 posi) or swap the transmission. I went with a new Tremec TKO600. I bought a complete kit from Modern Driveline. Again I explained what was unique about this car, and they put together a custom package for me that made it fairly simple. A friend helped, and we got it done in a weekend, less the drive shaft that I needed to send out for shortening. Now 75 mph is 2200 rpm, sweet. Then I needed to address the radio, it had a tacky aftermarket radio from the early 2000’s that didn’t work. So I sourced a proper 1970 AM FM Stereo Ford radio and had the Aurora Design internal upgrade done that gave me a perfect working AM FM stereo radio along with creatively integrated BlueTooth audio and hands-free cellphone operation. The conversion also provided line level outputs so I could use hidden modern amplifier and speakers. I highly recommend this. It was not cheap, but I get modern features and performance from a radio that looks totally stock. This radio is a stealthy as the 429 under the hood. Lastly a few details: I Replaced the existing clock with a Tach conversion from RocketMan's Classic Cougar Innovations, installed LED replacement lamps for the dash with new gauge lenses, and then upgraded to LED Tail/marker/turn signal lamps and associated electronics. Lastly, I replaced a few incorrect console, interior, and exterior trim pieces. And of course, did a lot of detailing and cleaning. So I guess all factory equipped 429 Cougars got that tach in the dash? This last June I was able to drive the car to the No Cal CCOA/Stray Cats show, over a 900 mile round trip with temperatures at 100 degrees without any issues at all. And with an average of 14.5 MPG for the trip! We don't know for sure exactly what drove the previous owner of Ted's Cougar to install the 429 but the quality and integrity of the installation will make almost any one swear that it must have "come that way" from the factory. The attention to detail is impeccable. Because the 429 did come in many '70 model Ford and Mercury vehicles you can't blame people for being persuaded that this stock. It also serves to prove that had Mercury really wanted to make the switch, it was possible. 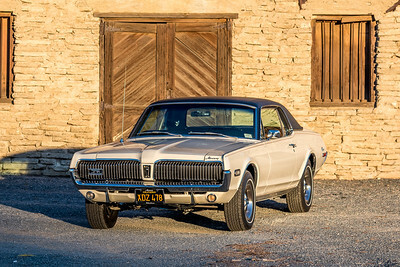 Like Ted's incredible '68, this Cougar gets driven. If you attend shows in southern California you just might get to see for your self. Look for Ted driving the '70 and his wife possibly driving the '68. In closing we asked Ted about his car's best attribute. This is what he told us. "Without a doubt it’s the drivetrain. 429 Big Block with a 5 speed is a lot of fun and certainly unique. And the fact that unless you are knowledgeable on Cougar specifications, this looks like a stock car." we could not agree more. The last word: Remember, Old Cars are fun. Get out and drive them! Really nice story about the car. I love the sleeper aspect too. Congrats on Ride of the Month. I have to admit I like everything about this car. On the surface it looks like a pretty nice example of a standard Cougar. Okay way better than just pretty nice. But still, it doesn't shout look at me; no Competition Orange paint here. And then if you peek in the window, you see that bag bad Hurst shifter and tee handle. Serious business. And the tag hints at what is under the hood: 4V 429. But when you do pop the hood it doesn't scream hot rod. Just the facts mam, 429 cubic inches of serious torque making muscle. Event the modern AC compressor is discreetly painted black. I love the way this car was built. The finished product is; dare I say "Understated" for a muscle car. If Mercury had built a 429 Cougar in 1970 I'm sure most would have been Brightly painted with the Eliminator package. And just think, A 460 would look just the same and nobody would know until you hit the loud peddle and roasted the hides down to the cords! Love the car Ted, congrats! Bill, you outdid your self. A new standard for ROTM write ups! Thank You. That is really a great car. Congratulations, Ted! Congrats to Ted and Bill! For once, the photos do not do this car justice. I don't think the late evening lighting, which usually makes any photo better, works with the Augusta Green color. And somehow the car looks more menacing in person. Anyway, a very cool cat and a great writeup!